Hello and Happy New Year from Awfully Big Reviews too! As the ABR review organiser, I'm really looking forward to all the books and ideas that the ABR authors will bring to this blog during 2019, starting tomorrow. 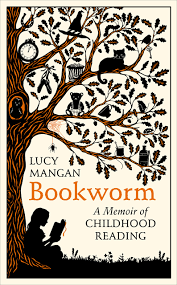 I'm only here for today, but I do want to mention a book that gave me much delight and pleasure during a run of wakeful Christmas nights: BOOKWORM by Lucy Mangan. This account of and reflection on her own childhood reading grew from a column in the Guardian and was published early last year. Mangan was, and is, someone who is happiest when reading, and part of the delight of this book is that she writes from a personal rather than academic point of view. Chapter by chapter, Mangan moves through her own experience of children's books and what could be called "the reading environment", from the horrors of formal reading lessons through to children's need to re-read books as part of their learning process and, later, the pressure of the peer group. Drawing on her memories of life as a dedicated reader in playgroups, nurseries, and classrooms, Mangan writes about hated and favourite early picture books, through to the illustrated world of Dogger, and series like Funnybones and her love for Gobbolino chapter books and, eventually, Blyton. We revisit the Borrowers and Narnia and What Katy Did and more. Later, thinking back to her time as a teenager in an ordinary comprehensive school, she muses on jolly school stories, on all the pony books and then the American "teenage writers" such as the beloved Judy Blume, the rise of the teen apocalypse novels, the Sweet Valley High franchise where she learns to feign enthusiasm, and what was the Twilight phenomena. You may not agree with all the books that Mangan chooses - she avoided fantasy, myths and legends, for example - or her view of different authors, but she gives a wonderfully nostalgic portrait of education, society and children's lives at the end of the last century, as well as revealing the security that the true bookworm, young or grown, gets from reading. Offering up her childhood, and the contrast between her parents, she shows that life as a true bookworm does bring and create its own problems. However, BOOKWORM is laced with a certain poignancy: as a mother, Mangan hopes that her six-year-old son will become as enthusiastic a reader as she is, but that his own practical nature - and maybe, I'd suggest, his own better sense of security - make it harder for him to be the kind of child who loses himself in a book. Honesty, humour, nostalgia, darkness, delight, gentle social commentary and a glorious trawl through the many books of ones childhood - what more could one want? I was enchanted. A great start to 2019!